Founder of Wing Lung Bank Limited and trained under the tutelage of his father & grandfather, who foundered the Lingnan penjing school. 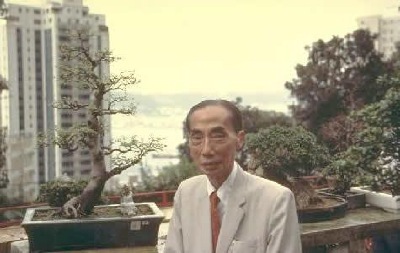 Please click on Man Lung Garden to visit and learn more about the wonderful contribution of the late Master Wu Yee-Sun, to the art of penjing. Please click on Man Lung Penjing for LINKAGE to their penjing organisation. Chinese hackberry ( Celtis ) by Master Wong Kee-Mein. Fire-Thorn ( Pyracantha ) in Cliff hanging style, by Master Wu Lik-Man. Hedge Sageretia ( Sageretia theezans ) Upright tree style by Master Lau Yiu-Fan. Fukien Tea ( Carmona ) in Partial Hanging Cliff style, by Master Wong Kee-Mein.